What are the best practices in business process automation? The best practices in business process automation are ensuring you prioritize automating the business process that is key to the core objective of your organization, making sure you select the right tool to execute it and seeing to it that everyone stays the course of your automation goals. Well-defined roles help everyone to get involved and committed to the goals of automating business processes within your organization. In a business environment, Business Process Automation (BPA) is a proven buzzword that never fails to excite any management team. Establishing plans and bringing about the actual roadmap for automating the business processes is a feel-good thing to do. However, when it comes to actually rolling out the plan across the organization, the “feel-good” factor vanishes and the implementation process becomes a nightmare, conjuring a surreal vision. Once you are convinced that BPA works for you, scroll down for how you could best achieve success in automating many of your existing workflows and processes. The compilation is a product our extensive research on the existing practices in business process automation that have shown results for those who have adopted them in their own industries and organizations. Those who commit to and execute Business Process Automation will stand to benefit from reduced costs by automating recurring tasks and sending staff elsewhere doing more meaningful jobs. Lowered costs and more efficient operations give them the margins and the agility to meet new business challenges. With well-organized information within easy access, employees will also save a substantial amount of time attending to their jobs. Such operational flexibility lends stability and translates to extending better customer service, which results in loyal customers happy to continue doing business with you. What are the 8 best practices in business process automation? Visions and missions are very exciting to be discussed. But the real hitch lies in getting them executed “successfully.” Similarly, there are various valid reasons to implement business process automation in your organization, which would ultimately redeem things thereby making the efforts constructive. On the flip side, automating the business processes would thrive only when it is done in the way it should be. 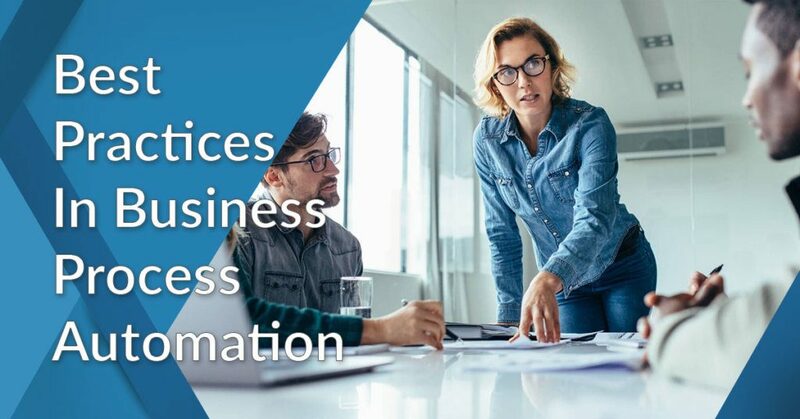 The following are the 8 best practices you should follow, in order to get the most out of your business process automation efforts. When you decide to automate your business processes, it’s quite natural to want to automate all the processes in a go. Nevertheless, that could be deadly to your automation efforts. During the first time, you’d know very little about automation and how it would resonate with your organization. Hence, “it is ideal to pick lightweight processes like travel expense approval, reimbursement approval etc. as opposed to mission-critical ones, in order to test the impact of automation, identify the roadblocks and arrive at the potential solutions to dispense with the problems”. After unveiling the pros and cons of automation, you may gradually automate the mission-critical and customer-centric processes. Another important tip to choose the first process prudently is to avoid picking a process that requires human intervention. Most organizations implement automation, reckon with that and then contemplate over the goals. Essentially, “the first step towards automation is to define its goals and then work backward to achieve the same”. Automation involves substantial investment of time and money. Therefore, it’s critical to gauge the performance and ensure at every step, that the results are worth the investment. If things fall through the cracks, it’d be attributed to an imprudent expenditure. This is why automation should follow a phased approach so that they can pull the plug while still involving limited investment if things do not go as expected. This way it also protects the organizations from ‘big plunge’ investment that would not work at all. “Once automation falls in place, consequently, there will be lots of changes in the roles of people. If it is not made clear to them, hassles like buck-passing, scapegoating, deflection etc. crop up”. To avert them, it’s important to establish the roles and responsibilities of every stakeholder involved in the process. Besides, it is also essential to set up a transparent hierarchy by identifying the process owner in order to enforce accountability within the process. To achieve this level of professional integrity, you should choose a human-centric solution, which the business leaders will feel comfortable with. Also, make sure you sit with them, elicit their current way of handling the process and align the automated process with the existing strategy. The strategic alignment plays a vital role because that is found to be the single most point of failure, in a BPM initiative. Automation is a drastic change introduced to the organization and hence will bring up active and passive resistance from the employees. As a result, there are all contingencies that your automation efforts go futile. Besides, it also deters them from embracing the change introduced by the management. “In order to encourage full-fledged involvement of the stakeholders in the adoption and evangelization of the new platform, keep every stakeholder on the same page and involve them right from the early stages”. Conduct a brainstorming session to understand the pain points so that everybody feels important in the organization. This way it also becomes easy to leverage automation to solve all the problems. “The real success of automation depends on how well the new platform is being embraced by the lot and how well they interact with the system”. Business process automation is essentially to enforce accountability on the process owners for the process to run smoothly. However, it is important to coach every staff such that they become well-versed with the new tool. Also, educate them about the fundamentals of the platform, the rationale behind the implementation of automation and the desired outcome. But, for the users to get acclimated to the new platform, it is critical to choose a software that is intuitive and easy-to-use and that which fosters self-learning. This way your users do not have to undergo numerous learning sessions to understand the working of the platform. “Automation is not a one-time process but an ongoing one”. Without continuous monitoring of the results that automation brings to your organization, it’s impossible to improve the efficiency of the process. It is the responsibility of the process owner to persistently gauge the performance of automation and make continuous amendments to get the best out of it. Usually, it is difficult to measure the process because their data is more vague. But if you determine what specific types of data you want to look at, you can use key performance indicators (KPIs) to break them down and make continuous improvements. The “Monitor and Optimize” approach is pivotal to the success of your BPM implementation. Overlooking it may leave your BPM system ineffective over a period of time. “While process automation technology is great, it doesn’t mean it’s impeccable.” There would be times where there would be a technical glitch, when your system would not be able to help you. But, that cannot put your day on hold and your processes cannot stop. This is when you would need to have a failover option to fall back upon. At such times, you would need human intervention to handle the processes manually. All automated business processes should contain such provisions so that they aren’t at stake. Sometimes machines do fail as well. Hence, it would not be ideal to rely solely on the systems just because you have made considerable investment on that. This is another important point to reinforce the fact that you need to choose a human-centric BPM. BPM is not a “one and done” process. You need to take multiple factors into account to accomplish the mission. Any initiative will thrive only if you follow all the conventions associated with that. If you do it haphazardly, it’d complicate the situation further and defeat the whole purpose of implementing the BPM system. Hence, while contemplating the implementation of BPM to solve your business problems, make sure you painstakingly follow the abovementioned best practices so that you reap the fruits of your investment and bridge the gap to make your process automation efforts a colossal success. This quick survey of the leading best practices in business process automation should give you a good idea how to go about implementing a similar program plan for your business. To proceed further, you will need to have a shortlist of the leading business automation applications on the market, to flesh out a good candidate. When you look over the list, pay attention to those that offer a free trial, which should give you a fundamental path to have a good feel of the software in terms of your employees who are going to use them.